The name ‘Garden Town’ comes from the Garden City movement of urban planning, created back in the 19th and early 20th century. The concept was all about well-planned, sustainable towns – and this still applies today. The Garden Town is Aylesbury - no new town will be constructed because Aylesbury has gained garden town status. 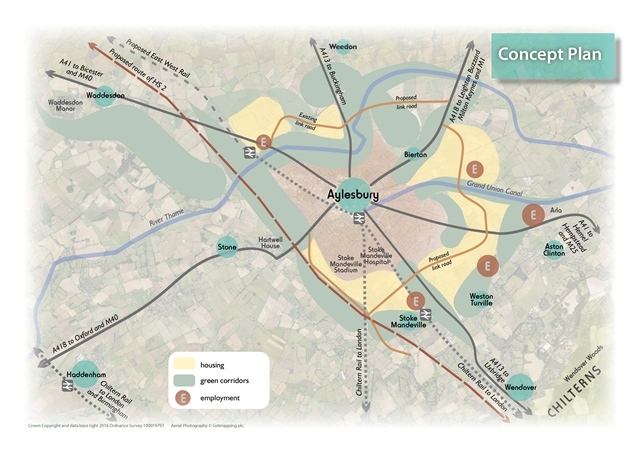 The town’s housing is already set to grow by over 16,000 homes by 2033 in our emerging Vale of Aylesbury Local Plan. Garden Town status will provide the support to better plan and develop this housing, and ensure new and existing development within the town works well together. Aylesbury is surrounded by beautiful countryside and its location in Buckinghamshire and proximity to the Chilterns AONB are part of what makes the town such an attractive place to be. In creating a Garden Town, the plan must include green spaces and natural environments for local communities. Developers will have to take our Garden Town status into account when proposing new developments through the Local Plan process. They’ll need to include more open spaces, trees, walking and cycle ways - and AVDC will do the same when renovating any areas. It’s not just about housing and infrastructure; alongside homes we are also planning for new jobs over the next 15 years. Being a garden town will make Aylesbury a more attractive place to live and work, giving businesses a further incentive to locate in and around the town, resulting in many opportunities for employment, both directly and indirectly. In 2015, three strategic sites in the Aylesbury Vale area at Silverstone, Westcott Venture Park and Arla/Woodlands (at Aylesbury) secured Enterprise Zone status, attracting businesses to the area. With a larger population comes a greater demand on services, from healthcare and transport, to leisure and retail. We therefore need to make sure that the town is prepared to deal with growth, and that growth is delivered in a sustainable way. We will be working with service providers including the Clinical Commissioning Group (responsible for planning healthcare), educational establishments, utilities providers, businesses, landowners, and a wide range of other key community members to ensure we plan for the growth and change. We will protect and enhance the character and setting of the historic villages around Aylesbury. Improved cycle and pedestrian links will connect the village settlements that surround the town. We want to work closely and positively with all the villages to help make sure Aylesbury Garden Town benefits everyone. Garden Town status will let us tackle road and infrastructure issues more effectively as we’ll be able to work in greater detail with developers, which in turn will give us access to other government funding. This will complement the proposed transport improvements set out in the draft local plan, as well as the Aylesbury Transport Strategy which is currently being created to better provide for the town’s transport needs. Improving connectivity, particularly with sustainable modes of transport, is also a priority and we will ensure moving around the town is easier.